Every customer that uses our services for appliance repair in Toronto and the area is in the center and our main focus! While fast and convenient repairs are vitally important to getting you back up and running, either washing your clothes properly again or keeping your food from spoiling, there is definitely more to say for expert repairs. That is why our technicians are highly experienced and motivated to provide the best possible service. Using brand new, original and fantastic quality parts, we will not only be there same day but will make sure your appliance is functioning perfectly by the time the appointment is over. 24 Hours a day, 7 Days a week Service! We know,how valuable your time is. 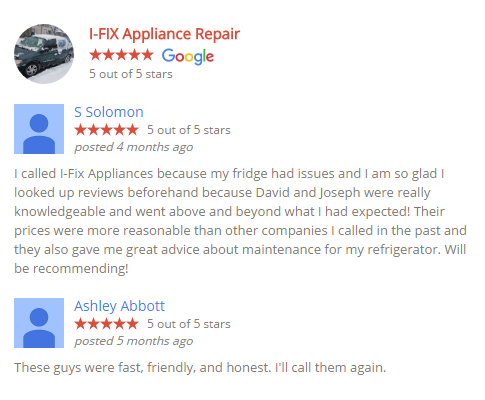 This is why we make it our absolute priority to provide same day service (when possible) for all your appliance repair needs. Fast, convenient and effective service must be part of the package. We will do our best to work around your schedule and make sure our arrival and repair time provide as little disruption as possible. Reasonable Prices for high quality service! There is, of course, a cost associated with fixing a malfunctioning machine but we make it our priority to provide honest and accessible services. Some companies will blindly bill you for an amount, not previously discussed, once they have finished the job. That is not our policy. We will provide a quote for the cost of labour and parts before the job has even begun, that will be held to no matter how long it takes to complete the repair or your malfunctioning appliance. How much does fridge repair cost in Toronto? How much does dishwasher repair cost in Toronto? Most of the household appliance malfunctions reveal themselves earlier. If you are doing laundry and notice excessive noise, or the washing machine skipping a cycle, the cookies in the oven come out burnt on one side, or refrigerator is leaking – these are the signs that they do need to be checked by a professional technician. Most likely, you will ignore the early warning signs and hope that the problem will go away. But, the truth is, it won’t. More than that, it might turn into a more serious problem. What are the signs of key appliance malfunction? Your washer or dryer has already started making some weird noises. In the beginning, the appliance operates very quietly but now it’s making some unexpected noises. Your oven or stove does not heat up to the desired temperature. If you ever start to notice that your stove is not functioning as it used to, it may be the time to call appliance repair technician to get it looked at. Your dishwasher is an older model. Like a car, with time, parts will start to break down, motors will show the wear and and any electric circuit board will start acting up. You have to pay a really close attention if turning on an appliance blows a fuse. In this case, you have to call a technician, as this appliance malfunction becomes a fire hazard. The washing machine is leaking. Even in new units, it’s very common that you might start to see leaks. This may be caused by something as little as a screw that has come loose, or a tube that hasn’t been properly secured, or in the worst case, it could be oil from the unit itself. All of which is a very good reason to call an appliance repair technician before it turns into more serious problem. The knobs on the stove are hard to turn. Underneath the knob that you’re turning, is a complex array of electrical circuits. It often happens that dust or water or, sometimes, grease can get inside the circuit board. When you start to notice that these knobs have trouble turning, do not force it. Contact professional appliance repair technician. You notice that the washer has “walked”. This was commonplace in older appliances – the motor and mechanical parts come out of balance and the washer literally starts to move in any direction. In this case the washer needs to be balanced. Generally, home appliances have been designed to last 10, 15, 20 years. As even well-made appliances start to age, there are different problems that appear with time. If you keep ignoring the warning signs, it might turn into a bigger problem. One of the most common reasons why your appliance breaks down is because it may have been overloaded well beyond its capacity. There are some occasional days where we have an extremely large load of laundry to do, or extra dishes to wash, so we simply throw them in. But if it continues on the regular basis, the extra load starts wearing out its parts. It will shorten the life of the unit itself considerably. The second most common reason an appliance breaks down is because of the quality of the electrical power that enters your home. Your appliances may be exposed to power surges, that are not only happening in rural areas but downtown Toronto as well. Why Call an Appliance Repair Technician? It is always important to keep the contact of a reliable appliance service technician that will be available to repair your broken appliances at a moment’s notice. It is also crucial that you communicate as many details about your appliance malfunctions as possible. available the same day to repair your malfunctioning appliance. 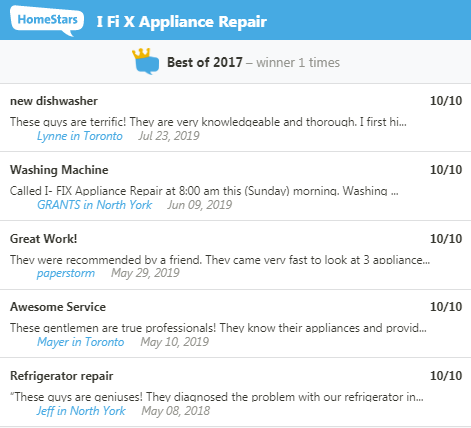 You also want your appliance repair technician to be local to get faster to your home, whether it is Downtown Toronto, Scarborough, or Vaughan. If you are looking for a reliable, certified, insured appliance repair technician in the Greater Toronto Area, make sure you give us a call!